Do Evil Spirits Lurk in Your Home? Clean the skeletons out of your closets, basement, and garage. Bring them to Maynard’s Household Hazardous Waste Collection Day. Leave materials in original containers. 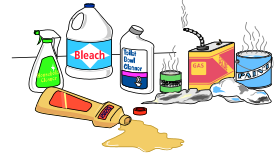 Sort and pack separately: oil paint, pesticides, and household cleaners. Pack containers in sturdy upright boxes. Pack your car and drive directly to the site. NEVER SMOKE while handling hazardous materials. $10.00 minimum charge per carload – unusually large loads will require additional fees. Payment: Checks payable to Town of Maynard, credit or debit cards are also accepted. NOTE: If you miss this event, please visit our Household Hazardous Waste Disposal page for information about other municipalities and regional facilities that are available for properly handling and disposing of this type of waste.